The Rolls-Royce Phantom IV was hand-built exclusively for royalty and heads of state, it is the rarest of the spectacular Phantom range and the most exclusive Rolls-Royce model ever built. By creating the Phantom IV the manufacturer broke with their earlier decision to cease production of the series of "big" Rolls-Royce Phantoms after the end of the Second World War. Only 18 were made between 1948 and 1956. The genesis of the Phantom IV comes from two experimental motor cars, a large Park Ward seven-seater limousine body, affectionately known as Big Bertha and the Bentley nicknamed Scalded Cat, both fitted with an 8-cylinder engine designed for military vehicles. In 1937 was hypothesized to fit this engine on the Rolls Royce Wraith but the project was abandoned. The story of the conception begins on 15 November 1948, not long after Prince Philip had driven the Scalded Cat, an order came through for a Rolls-Royce motor car for Their Royal Highnesses Princess Elizabeth and Prince Philip. The royal model was created under code name 'Nabha'. It was finished in July of 1950 and painted Valentine green. It arrived at the Duke's home with a public announcement that stated the Phantom IV had been 'designed by the special order of Their Royal Highnesses, the Princess Elizabeth and the Duke of Edinburgh'. The chassis design was taken from the Silver Wraith, some length added on, and some strengthening and overall length measured at 229 inches with a wheelbase of 145 inches. All examples of this unique model were bodied by independent coachbuilders and their bonnets surmounted by the kneeling version of the Spirit of Ecstasy. The engine was a derivative of the 8-cylinder rationalized B range petrol engine of 5675 CC with overhead inlet and side exhaust valves. Specifically it was a refined version of a B80, the last three of a B81, both used in military and commercial vehicles. It featured single-plate clutch, 4 speeds auto and hydraulic front brakes and mechanical rear brakes with servo. It had also had independent front suspension and semi-elliptic rear springs. It had the distinction of being the only Rolls Royce with a straight-8 engine that could run lengthy distances at a very low speed, which was perfect for the purpose of the vehicle as a ceremonial vehicle. The Phantom IV was capable of performing from walking pace on ceremonial occasions to impressive top speeds far exceeding what current sports cars could achieve. The Phantom IV has been owned by other esteemed owners like the Queen's sister HRH The Princess Margaret and The Countess of Snowdon. Spanish Head of State, General Franciso Franco owns three customized models; two limousines and a cabriolet. Today they continue in ceremonial service with HM King Juan Carlos I of Spain. Other owners included the Shah of Iran, Emir of Kuwait, HRH Duke of Gloucester, HRH Duchess of Kent, The Aga Jhan, Prince Talal Saudi Arabia, King of Iraq, Shah of Persia and Prince Regent of Iraq. Principally used as a formal car of State, the majority of these magnificent vehicles were built for ceremonial work and provided the greatest of comfort for their occupants. Just seventeen Phantom IV models were manufactured for sale (although one further Works test car was built and subsequently dismantled). Of these, 16 specimens have survived. Chassis No. 4AF20. Rolls-Royce received an order from Franco Britannic Auto of Paris, the agent for the Aga Khan III, on April 25th of 1950, prior to the first Phantom IV reaching its intended customer. 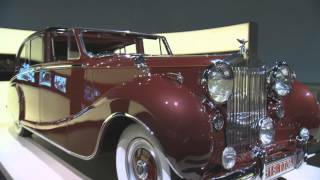 The Phantom IV purchased by Aga Khan III, the 48th Imam of the Nizari Ismaili community, was a Sedanca de Ville wearing coachwork by Hoope.This is the only one with this body style and it took more than two years to build it. It was constructed on the original 'A-Series' chassis and supplied with a special steering position, French-type headlamps, US-type bumpers, flog lamps and a continental chassis plate. The elegant design was penned by Osmond Rivers, chief designer at Hooper. It has long flowing front wings and articulating rear-wheel covers that open in a most unorthodox fashion, allowing full access to the rear wheel. It also features the Hooper-patent de Ville extension over the front seat which, when not in use, is hidden by sliding in one piece under the rear portion of the roof. The front doors were designed to be large and to open as wide as possible. All doors were fitted with the best quality locks, concealed hinges, Hooper-pattern streamlined outside handles, and combined remote control and pull-handles to all doors. Inside, there is room to accommodate three passengers on the rear seat with two occasional seats facing forward and designed to fold flush into the back of the division. There are removable shutters which can be fitted to the quarter windows. Also increasing the privacy for the occupants, there is an electrically operated shade which covers the rear window. All windows, including the division, were electrically operated and controlled by self-canceling switches. All window mechanisms were also fitted with a manually operated winding device for use in an emergency. The armrest in the rear seat contains an adjustable mirror, silver brush and comb, two glass jars and a sterling silver compact. All of these items were engraved with Aga Khan's royal crest. Rear passengers were also treated with telescopic ashtrays, lighters and two small tables which sung from the division above the occasional seats. There is a cabinet of polished French burr walnut that contains a full picnic set, complete with two thermos flasks, two sandwich boxes, four plates and one nest of four silver breakers with gilt interior. The cabinet illuminates with the opening of the door. The vehicle was originally finished in dark forest green with a lighter olive green band at the waistline to match the Aga Khan's Phantom III. The rear cabin was upholstered in Connolly's red leather throughout with red cloth headlining and matching mohair rugs, loose covers, squabs and cushions. The royal crest was applied to the doors. The work was completed in the early 1950s and it was loaded aboard the S. Maidstone on April 26th of 1952. Its journey took it to Villa Yakimour in Cannes, France. It spent most of its early life along the Riviera. Upon delivery, it was registered in France and retained at the Aga Khan's estate where it served as the transportation of choice for the immediate family and their guests. Presumably the car warranted the royal family’s full approval because it stayed in the Aga Khan’s possession for the rest of his life. When Rolls-Royce has sold the car to Aga Khan, they had included a clause which stated he was not to sell the car. After he passed away, it was used for few years and then sold by his widow Her Highness the Begum Omm-e-Habibah. The car is currently exhibited at the Rolls Royce museum in Munich Germany. Another Rolls Royce Phantom IV is also included within Mr. Ion Tiriac’s car collection, previous owned by Ernest Hives, Rolls Royce director, then to The Princess Marina and The Duchess of Kent. The Tiriac Collection is the only current gallery including all 6 Phantom models of the I-VI series. Historic register Hooper & Co.